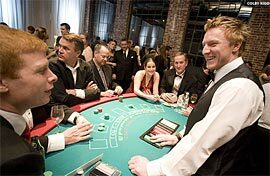 The first thing a blackjack player needs to understand before playing blackjack is that in blackjack card suit doesn’t matter and the point value of each card and each hand is the only thing that matters. The game objective is to get a hand value of over 21 or a point total that is higher than the dealer's without going bust. A hand's value is the sum of the card values. The deck consists of four suits and they contain 13 cards, ranging from an ace to a king. They are ace, 2, 3, 4, 5, 6, 7, 8, 9, 10, jack, queen and king. To value a blackjack card from 2 to 10 you should simply examine the numerical value in the form of a number at the corners of the card. They are always played at their face value. For example, a 2 is valued at 2, a 3 is valued at 3, a 4 is valued at 4, etc. Critical cards in blackjack are 10's, since an ace and a 10 give a total of 21. Getting a blackjack (a natural total of 21) makes a big difference in the player edge since it results in a 3 to 2 payout. In blackjack 10, jack, queen and king have 10 point value for adding purposes in order to establish the total of the hand. 10’s are more important than any other cards and there are a number of reasons for that. First of all, there are sixteen 10-value cards in the deck, and therefore they are the most frequent cards in play (there are 16 cards worth 10 points in a 52 card deck. All other cards only have 4 cards worth their value). The most powerful blackjack card is the ace, this card is of great importance because it is worth 1 point or 11 points whichever is most advantageous to the player. 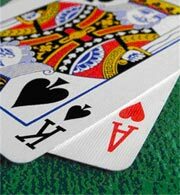 A hand with an ace is called a "soft hand" because if the player decides to take a hit, he will almost never bust because the ace will be counted as 1 instead of 11. For example, a hand containing 10-2-Ace is merely a 13, not a 23, because the player simply values the ace as a 1. Often the novices in blackjack think they’ve busted, because they value the ace as an 11 instead of 1. The least advantageous card in the deck for the player is five since with a five in hand it is really easy for a player to go bust. If you took all four of the 5's out of the deck, you'd turn then advantage over from the house to the player instantly with only that one change. Without such cards as 5 and 10, card counting would be impossible. Depending on the original hand’s value, you can choose what to do next. You will learn more about blackjack options in the next section.